It's always stressful when you have to be out. Especially if you are sick! You are left wondering if your students are behaving, are they learning, who is your sub, is there enough work, etc... That's why I decided to write this post for some tips for a successful experience when you have to be out. One: Leave plenty of work. Some subs will blow through the work you leave behind at record speeds. Leave plenty of alternate activities for the sub to do to use up time. You don't have to run off a million worksheets, you can come up with plenty of alternative activities for them to do. Leave some I Have Who Has games. These are great for subs because students do all the work. Plus, they can be played multiple times with students getting to practice a different problem each time. 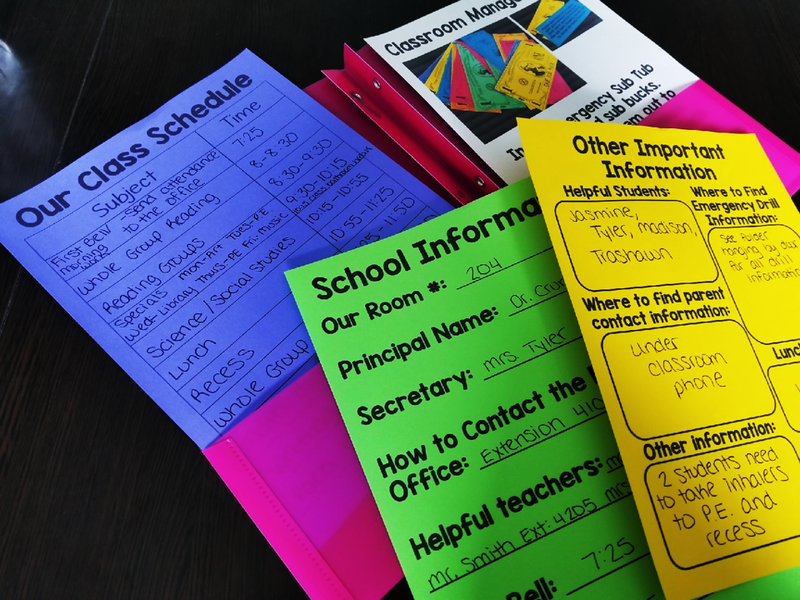 Subs appreciate having plenty to choose from, as well as activities that they can do with students. This HELPS them with classroom management. If something isn't working, there are plenty of other activities to do. Two: Don't expect your sub to be you. Sometimes teachers get too caught up with trying to make sure their classroom is run exactly how they would run it. They leave extensive notes, binders of information, and just totally overwhelm the sub! Less is more! Give your sub manageable information, but don't overwhelm them with things they don't need to know. Your students likely know your routine, and they can help. Leave important information in a folder along with the plans for the day. Don't expect your behavior management system to be followed to a T. It just is not as easy for a sub! In fact, I have found that giving subs flexibility is when they are most successful. 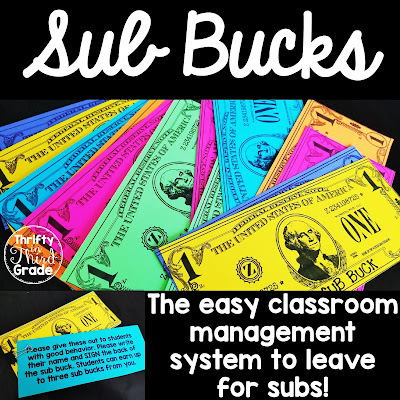 Instead of leaving your sub a complicated behavior system, try leaving a stack of Sub Bucks. The sub signs the back and gives them out to students with excellent behavior. When you return, students who earned a sub buck can turn them in to you for your choice of a reward. If you leave notes in your plans to take students outside for recess, it will rain. :) It just happens that way! So leave a note for an alternative to going outside. I recommend leaving instructions for how to use GoNoodle in the classroom. You can also leave directions for Four Corners or Heads Up 7 Up. This is all beneficial if you get a sub who HATES to go outside for whatever reason (allergies, dealing with behavior, the heat, etc...). I have had subs refuse to take my students outside before and instead made them work in class the whole time. I felt bad when I found out, so now I always am sure to leave indoor recess suggestions. 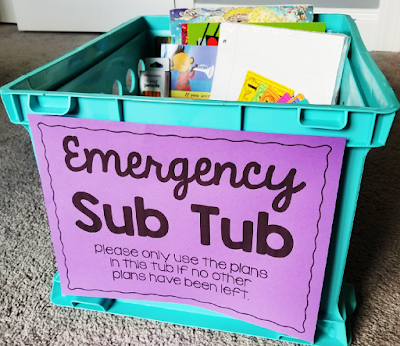 Set up an Emergency Sub Tub at the beginning of the year and put materials in it to cover an entire week out. You never know when an emergency will happen and it's important to be prepared. If you have PLANNED absences, do not use this tub. Use it for the extreme moments when you are unexpectedly out. I hope these tips have given you some ideas for how to help your sub have a more successful experience!